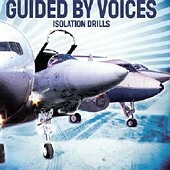 Guided By Voices is one of those bands I'm supposed to like. I'm 26, white, male, went to college, self-admitted "critic" of "main"-stream "mus"ic. I am the target market. But I don't get it. I think it's because I don't drink enough. This is the sort of music that I never liked because it never made enough sense to me and I'm the sort of chap who wants music to do that sort of thing. My friends who like this band all drink enough and debate my derisive comments, aggressively disagreeing with the same sort of half-slung rambling given to me at the Grateful Dead concert I attended in 1995 at Shoreline Ampitheater when a whirling nineteen-year-old dervish responded to my consternation over why so many seemingly rational people would idolize the likewise half-slung rambling of a certain overage, overweight, overwrought Jerry Garcia (who, like Robert Pollard of Guided by Voices, wrote, like, a hundred songs a day) by saying, "Duuuude, it's Jerry, man. You just have to feel it." Well I'm sorry people, but I need adjectives. Verbs. Nouns. Clauses. And music is not some sort of party trick where you get more credit by making a lot of songs, real fast. Despite Robert Pollard's promising potential (he's the main guy for those of you who haven't kept up) from early albums like "Bee Thousand" and "Sunfish Holy Breakfast", this latest forray into the bracken netherworld of full-scale studio production sounds less like lo-fi genius finally getting its due (a la Elliot Smith) and more like big label cronies sucking the life from one more talented artist in hopes for another Goo Goo Dolls. Not that there's anything wrong with that. I think bands that have paid their dues deserve a payoff no matter what die-hard fans of the good 'ol days think. But what's with all the grandstanding on Isolation Drills over repetetive and, let's face it, basic guitar riffs that seem to vamp around for no particular purpose as if the electric guitar was just invented last week? That's not to say that this is a "bad" album per se, or that this is by any means a "bad" band. It is not and they are not. It's just not "genius" or "brilliant" or "groundbreaking" or anything remotely similar to those descriptions given to it by their idolatrous fan base. To me it sounds like The Replacements without all the freshness that comes from being, well, fresh. But take heart you faithful hoardes of indie-fans, I don't like My Bloody Valentine either. I don't like those long breaks in Spiritualized songs when our collective slacker butts are supposed to be whipped into a frenzy by the dizzy reiterations of guitars and drums. Just like GBV, that doesn't mean it's "bad" (like a dog is "bad" and must be punished). It just means that for those of you out there that fall into that space between Spiritualized and Grandaddy rather than between Spiritualized and Phish, this album is probably not for you. If you love Sebadoh more than your own mommy, you'll probably think it's genius. In fairness and full disclosure, I must admit to liking the song "Glad Girls" not so much for its sort of annoying chorus but it's the first time in the album I was surprised by a turn a song took. There is, amazingly, an element of the Smiths, the Dandy Warhols, and Husker Du that weaves in and out of the full-scale-production-four-wheel-drive model GBV--and believe me, those are definitely not "bad" bands to compare to your worst album. "Chasing Heather Crazy" likewise has this early-nineties brit-rock-Aztec Camera-meets-the Stone Roses feel to it and those aren't "bad" bands either. "All the world is coming down around her," the ending refrain that caps this crispy character portrait is reassuring and offers a nice balance of indie arcanity and pop redemption. In fact, that's a good description of the album as a whole: hummable, forgettable tunes that graze the thin line between indie and pop, art and product; just weird enough that you don't have to be embarassed that you like it, and just bland enough that there is really nothing original about it whatsoever.